As usual, after the Apple keynote in Cupertino on Wednesday, the company opened up the room to hands-on demonstrations from the assembled press. And this year's gave a first indication of just how big the new iPhones are. Dieter Bohn of The Verge held the XS and indicated its unusually large size. "The iPhone XS Max is bigger, yes, but as you can see in the photos it is almost hard to distinguish the two when you're looking at photos," he wrote. "It feels much better than any "Plus" iPhone ever has. I always found the Plus-sized iPhones to be ungainly, but the Max seems to be a little more ergonomic in subtle ways. If you've wanted a Plus before but were put off by the size, I'd at least try to hold the new Max size before making your decision." 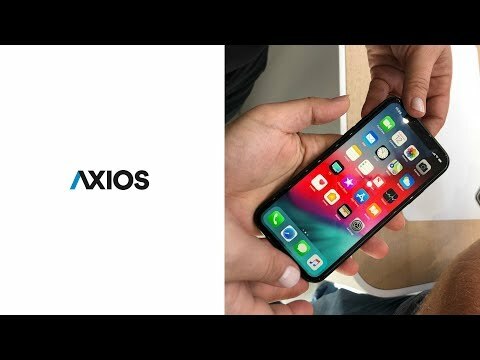 Ina Fried of Axios posted a hands-on of her own. The bezels on the XR look bigger than the XS. That’s the only thing I don’t like about it. XR is gonna confuse so many casual costumers. Such a lost opportunity for a smaller form. XR is impressive if it offers the same width in logical point size as the Plus size (414). And its 828 pixel width makes that very probable @ 2x. Landscape mode users will enjoy this vertical space in a smaller form factor. What do casual customers (not even sure what you man by that phrase) have to do with smaller form? Xr is for those who don’t want to spend $999 for the latest phone and/or want a phone in bright colors. No, it's not going to confuse "costumers", for crying out loud. God I hate phablets. Steve did as well. Gone are the days when Cook made fun of Android's fragmentation. He's now in the same boat as he is as clueless about what's good for the customer as the Android folks. You have no idea what fragmentation means, do you? Poor Cook, just stumbling around blindly as his company rose to become the most successful ever in the history of humankind. Poor guy. You should get him a memo, help the guy out. Is the XR not having 3D Touch not fragmentation? The lack of a feature is not fragmentation. This is a single bit in the OS, exists or not. Fragmentation is what causes developers to redesign their applications, their layouts, UIs, comm protocols etc.. for myriad of different devices. Have you even compared the overall size of the iPhone Xs Max to the iPhone 8Plus? The 8Plus is actually taller. This isn't the size of a typical phablet, it's actually very comfortable in my hand, fits in my pocket, and has a large enough screen for me to read and use the keyboard without too many issues. Here's a comparison between the new iPhones and the iPhone 8 along with dimensions for the iPhone 6S. If you want the tiniest phone possible, then get the Apple Watch but the iPhone Xs is the same size as the base iPhones from at least the iPhone 6s so why are you complaining? Suggestion for followup article. Please create an easy to view feature comparison between the new iPhones along with the iPhone 8 and 7 (which are still being sold--note the original iPhone X is no longer on the market). More like you don't. How many different sized screens do we have now for the iPhone? Now, do that count again when Steve was alive when both Steve and Cook made fun of the Android team at every product announcement. So, who's laughing now? Steve is rolling over in his grave. Also, money is NOT how you measure future product roadmap. Steve's quote is famously in the lobby of the Apple campus but apparently people walk by it every day not knowing what the hell it means. Let me tell you something sonny, right after Sculley kicked Steve to the curb, he grew Apple for 7 more years until he milked every last drop that he could out of the Apple 2 platform. It was then all downhill from there and he, in turn, got kicked. The same is happening with Cook. Just because he's able to milk iPhone to great heights doesn't mean that the gravy train won't end someday or soon. You need to ask yourself, what's going to replace the iPhone. The Watch??! Hahahaha! That's really funny! So no, you don't know what you're talking about. The Xs is essentially the X. Even the prices are the same. There is only ONE aspect ratio now. All three new models feature the same aspect ratio. Add to this the 16:9 ratio of the 6-8 series then you have two. Add to this the auto-layout feature of iOS then you have NO screen size problem. You do realize it's not just about the aspect ratio don't you? An app that looks good on a 4 or 5 will need changes to look good on a plus. Apple will turn the iPhone gravy train into an AR virtual hyperspace vehicle that will take you anywhere your eyes and ears want to go. You will wear your phone/computer on your face. You better hope so as this gravy train is long in the tooth. You can see how incremental they're changing the models now. Cook is so desperate that he's resorting to playing around with screen sizes in order to get people to buy increasingly more expensive phones in order to keep propping up the stock. For someone who's always talked about not worrying about the stock price or managing quarter to quarter earnings but only on building the best products that sure sounds like a bunch of bull now. He's now fully engaged in managing earnings and getting people to buy more and more expensive machines with gimmicks rather than genuinely innovating. Total nonsense. Having more than one size isn't what makes "fragmentation" a software engineering problem, especially with adaptive-layout. Fragmentation in the android world is the assortment of operating systems, versions, vendors, and hardware that makes it more challenging & expensive to maintain a codebase, leading to abandonment. It's why android handsets, including Google flagships, drop support not long after the products are released. They do not enjoy the developer support nor the lengthy OS-provider support that iOS devices enjoy. Sorry son, but I do this for a living. I doubt you do. Oh, but you were a close person friend of Jobs, I forgot. How well did you know the man? You've exposed yourself as somebody ignorant of Apple history. Incremental, iterative development is how they do product development and have always done product development. The second Macintosh (the "fat" one) was an incremental update to the original. Oh but you're angry at gimmicks! Cool story bro.